EQUINOX is traditionally the season for getting back to the time-old occupation of watching sunset, full-moonrise and the autumn heavens. It is onset of the aurora season when for some inexplicable reason there is more geomagnetic actiivity (related to solar flares) and, it seems, the time for other celestial phenomena. These include nacreous clouds – those wonderful ephemeral patches of rainbow light which appear and as suddenly disappear around the edges of evening cirrus. There have been seen lately a lot of what in American terminology are called sun-pillars and sun-dogs (in the case of Venus, Venus-dogs!) where the pillar describes a shaft of light extending vertically from the light body and the dog a similar extension of light in a lateral direction. With the gradual brightening of Venus, the chance of seeing this phenomenon becomes more likely. 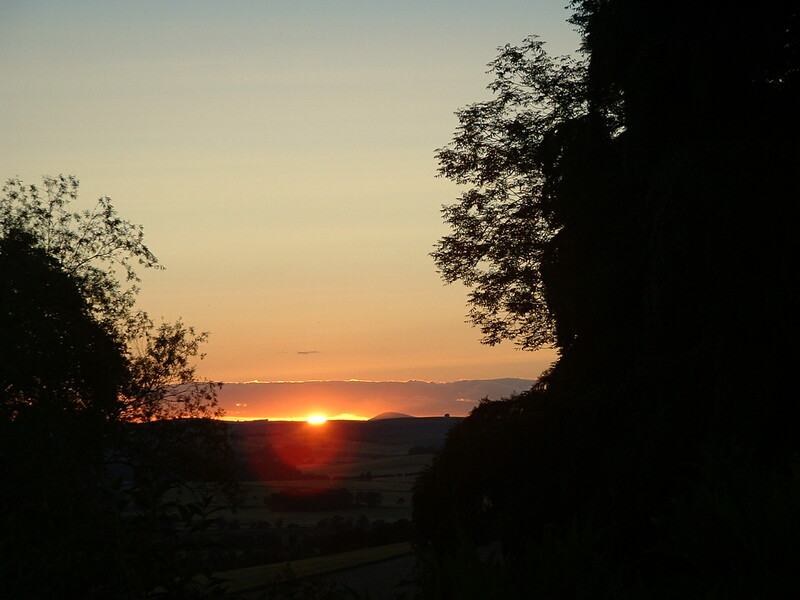 Sun-pillars are a regular feature of sunset around autumn equinox, even lingering as a great shining after the sun has set. With the continuation of our spell of ‘Indian summer’ and exceptional clarity of light, we aren’t surprised to find a phalanx of photographers most evenings at the well-known recumbent circles in the Northeast and some even at those lesser-known. 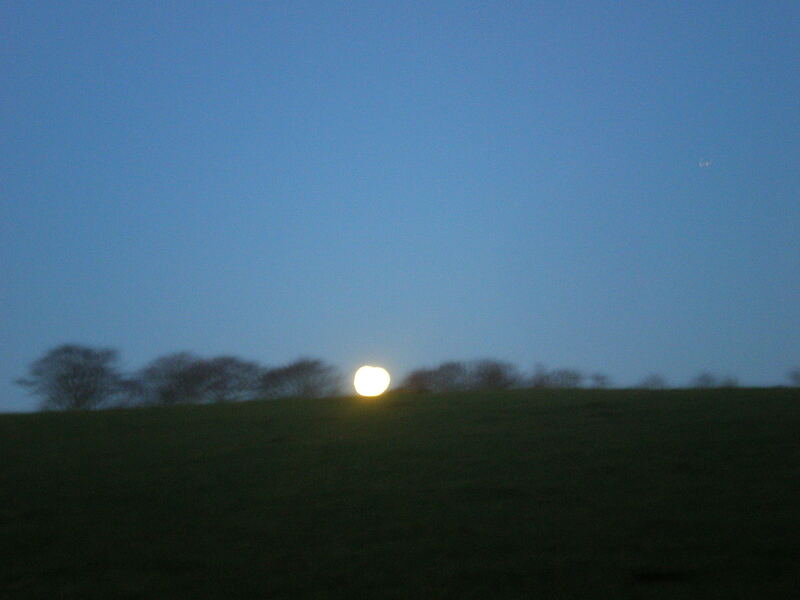 On equinox night, a magnificent solar ‘roll-down’ occurred, as seen from Shieldon (non-recumbent) circle at NJ 823 249 near Whiterashes, due west to the Buck of the Cabrach where a little before 7pm (BST) the flaming orb of an equinoctial sun did its primeval tumble down the northern slope, setting into a notch of the Cabrach (Alexander Thom eat your heart out!) and flooding the Garioch with an almost ethereal light. It is no wonder that FOGS who were considered ‘fringe’ 20 years ago are now being joined by a growing number of sky-watchers: all meeting by chance in the stone circles of Aberdeenshire, Kincardine and Banffshire to witness such autumnal glory. We think the practice is catching on! CIRCLE-watchers may have noticed a sudden straw bale sculpture appearing as if by the wave of a cosmic wand on the Garioch-dominating plateau at Kirkton of Bourtie, NJ 801 249. However, unlike the crop circle which appeared mid-morning on an August day in 1995 in a wheat crop on a Culsalmond farm, the circular structure at Bourtie is decidedly man-made. It is the inspiration of sculptor Keiji Nagahiro, combined with dowser Peter Donaldson and farmer Ian Peddie, who with broad grin from tractor cab manipulated bulky but beautiful round bales into position (no mean feat) while the ideas men looked on and directed the final shape in an attempt to replicate the circle’s original alignment. Its ultimate position – a recumbent circle in straw – is all things to all men – or at least to these three: to one it is a fleeting glimpse of what might have been, created in rustic splendour to last no more than a single season; to another, it was something fun to do after harvest but before the ‘back end’ dictates when everything is brought in; to the dowser it is a physical shape superimposed on an energy signal received by the dowsing rod. It has been a fascinating exercise in people-watching: on the day it was created – one week before equinox – two Californians strolled up the slope, utterly unsurprised by the manifestation. BBC Radio Scotland was quick to send a researcher who was transported by the site, its structure and its vista. Others have followed, often spotting the sculpture from the road and screeching to a halt, entranced. Our members have only a little time to see it in its present glory as the farming year and equinoctial gales (so far, amazingly absent) will soon dictate its being or non-being. We recommend it, if only for the presence it brings to this ancient place, in a way regenerating in the imagination how the circle must have looked to its early architects 5000 years ago. To FOGS who follow shadow casts (especially good at equinox), the bales add another dimension to shadow outlines in barley stubble while low sunlight highlights cropmarks of an avenue approaching the circle, peppered with quartz pebbles, a hallmark of NE circle design. The imagination soars. Post scriptum on above article: Google Earth continues to display this sculptural-stroke-agricultural-energetic phenomenon: as the aerial photo used in their GoogleEarth page for Kirkton on Bourtie will show. This clearly dates GoogleEarth’s map coverage of Aberdeenshire to the autumn and winter of 2002. IT IS with sadness that we have to announce the untimely death of Dr Nick Bogdan, one of the leaders of the Fetternear Episcopal Palaces Project this autumn. He will be greatly missed. At this time it is difficult to predict how the work in which he was involved will continue, but his partner and fellow archaeologist, Dr Penny Dransart has our blessing and condolences. We wish her well in continuing the work they both began and will report when future plans are further developed. FOGS might be forgiven for thinking our efforts often go unseen or, more colloquially, that we spit in the wind; but occasionally, a success is eeked out through perseverence. Such is the case with the Druidsfield (known to Historic Scotland as Broomend of Crichie) ritual henge, avenue entrance and Pictish carved stone at Port Elphinstone, Inverurie NJ779 191-6. We added our voice to local opposition to a plan for development of a certain hamburger chain to adjoin the circle and ditch – visions of half-eaten buns and related waste floating in a prehistoric context made more than FOGS’ hair curl, it seems. Thanks in great part to Inverurie businessman Bob Minto and his supporters, the burger meisters will find another site and the Druidsfield will continue to provide pleasure for local walkers. It has been reported that this very field has been acquired by Aberdeenshire Council, for unknown purpose and for an undisclosed sum. Locals are again on the warpath. We shall confirm. MIDWAY through a week of solid rain, FOGS’ AGM turned out to be one of brilliant sunshine with not a cloud in sight. Dowsers – new and experienced – were seen lurking, bending, pacing, doing all the bodily antics that dowsers do among remnant woodland near Midmar Kirk. Visitors were drawn from Dundee, Glasgow and Inverness, along with a full complement of regular FOGS who seemed to enjoy every minute. Results not all yet in, but preliminary consensus would have it that the Midmar Kirk recumbent circle may be a later progression, with its operative stones moved a few metres downslope from an original site focused on the Balblair monolith nearby. A visiting Dundee lecturer in architecture specializing for his Ph.D. in geomancy [yes] said he came because the grid between latitudes 56º and 58ºN are considered ‘most sacred and most proliferated with stone circles in the world’ (his quote) and he wanted to feel it for himself. We are grateful to Phyllis Goodall and Peter Donaldson for leading the dowsing and encouraging so many newbies. More meetings of the like were enthusiastically recommended. Printouts of the dowsed circle will no doubt appear in due course but, as our scientist-dowser is now our new membership sec, please give the man a chance! In the meantime, his consummate dowsing and mapping of recumbent stone circle and Bronze Age cemetery at Loanhead of Daviot is here.